This is an important and elegant paper out last week in PNAS. Abstract: How does uncertainty about “dangerous” climate change affect the prospects for international cooperation? 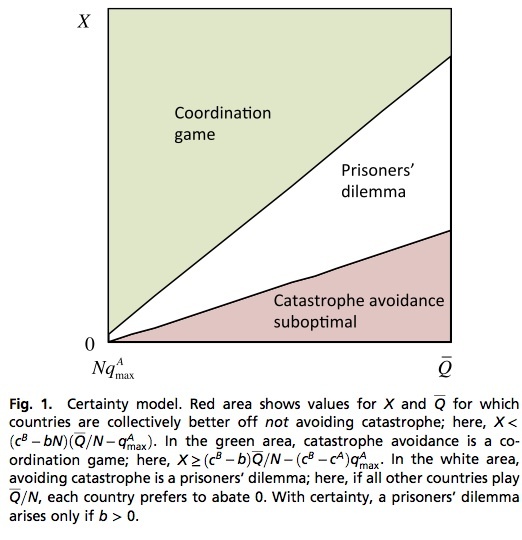 Climate negotiations usually are depicted as a prisoners’ dilemma game; collectively, countries are better off reducing their emissions, but self-interest impels them to keep on emitting. We provide experimental evidence, grounded in an analytical framework, showing that the fear of crossing a dangerous threshold can turn climate negotiations into a coordination game, making collective action to avoid a dangerous threshold virtually assured. These results are robust to uncertainty about the impact of crossing a threshold, but uncertainty about the location of the threshold turns the game back into a prisoners’ dilemma, causing cooperation to collapse. Our research explains the paradox of why countries would agree to a collective goal, aimed at reducing the risk of catastrophe, but act as if they were blind to this risk. Communication is the essence of negotiation, and it is striking how the players used their proposals and pledges differently depending on threshold uncertainty. When the threshold was known, players communicated so as to coordinate to the thresh- old. When the threshold was unknown, communication was more strategic. 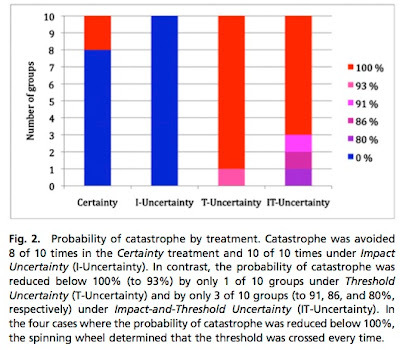 Mean proposals for the Certainty and Impact Uncertainty treatments are very close to 150 (Table 1), with 83% of subjects in Certainty and 94% in Impact Uncertainty proposing precisely this amount. 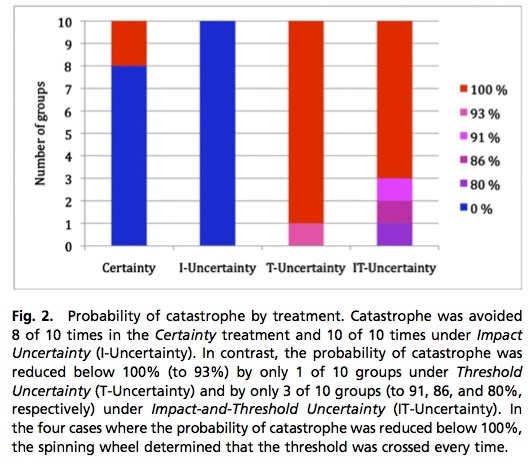 Mean proposals in Threshold Uncertainty and Impact- and-Threshold Uncertainty were significantly larger (Mann–Whit- ney–Wilcoxon test, n = 20, P < 0.05 each), with 29% of subjects in Threshold Uncertainty and 35% in Impact-and-Threshold Uncertainty proposing 200. Why did not more participants propose the collectively optimal 200? Answers to questions in our follow- up questionnaire provide a strong clue. Participants perceived their proposals as serving to motivate other students to contrib- ute; they thought that a proposal below 200 was more credible and so was more likely to stimulate contributions by others. Fig. 3 shows the relationship between pledges and actual contributions. 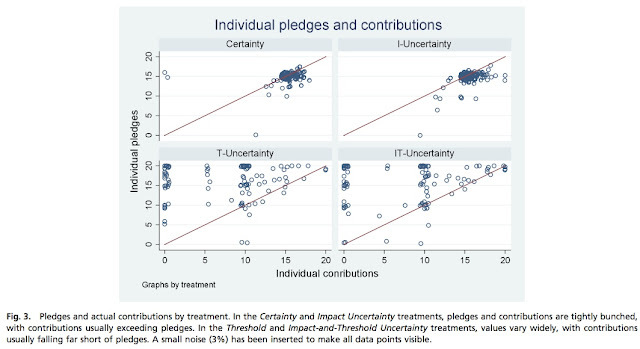 In Certainty and Impact Uncertainty, almost all players (98% in both treatments) contributed at least as much as they pledged. Two of 200 contributed substantially less than they pledged, causing the two breakdowns in collective action in the Certainty treatment. By contrast, in the Threshold Uncertainty and Impact-and-Threshold Uncertainty treatments, most (82 and 75%, respectively) contributed less than they pledged, indicating that pledges, like proposals, were used strategically. Our follow-up questionnaire revealed that the reason for these differences had to do with the context in which decisions were made. Fairness and trust were more important considerations for the coordination games than for the prisoners’ dilemmas. Players were more trusting in the Certainty and Impact Uncertainty treatments because each recognized that the others had a strong incentive to be trustworthy in these situations. A final observation concerns attitudes toward risk, which can play a crucial role in the analysis of collective best outcomes (29). Our theory assumes that people are risk-neutral. Our questionnaire reveals that a majority of subjects are risk averse, but sta- tistical analysis shows that whether a person is risk averse has no discernable influence on behavior (SI Results). Once again, the context of these games seems to shape how people behave.